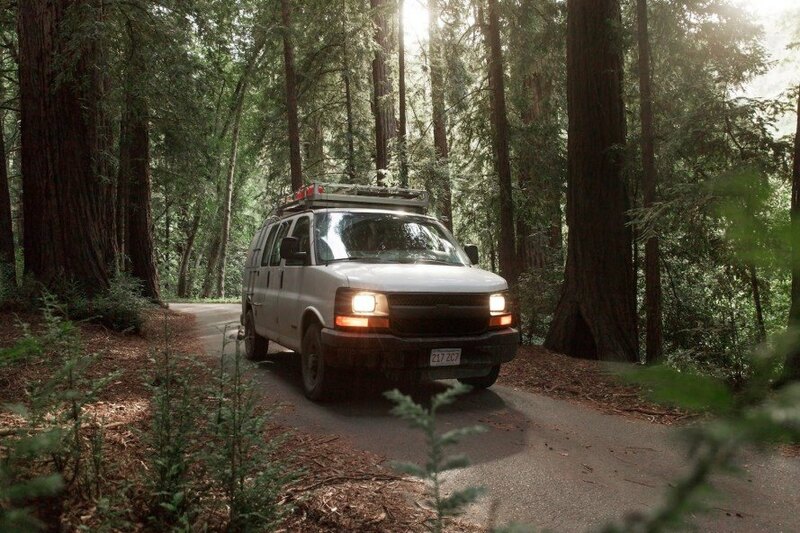 When 23-year-old Zach Both quit his desk job to travel the open road in a converted van, he didn’t just use his newfound freedom to live and work around the country—he also embarked on a mission to help others do the same. Zach, who works as a traveling filmmaker, renovated an old Chevy cargo van he bought off Craigslist into a beautiful contemporary mobile studio outfitted with solar panels and even a home theater system. In a bid to share his experience and knowledge, he also created The Vanual, a “complete guide to complete freedom” with DIY steps to building your own converted campervan. Zach bought his used 2003 Chevy Express van for $4,000 in August 2014 and spent a total of $15,000 to convert the van into his mobile dream home. While he concedes that the cost was high (and more than he initially anticipated), it allowed him to achieve a stunning custom build that maximizes every square inch of space and is tailored to his exact specifications. The exterior was kept white to stay as inconspicuous as possible, however, the interior sports a stylish timber-lined living space inspired by minimalist Scandinavian design principles. The converted van comprises a futon bed on one end and a L-shaped desk space with an integrated kitchen on the other. His kitchen features an ARB 50-quart Fridge/Freezer combo as well as an Origo two-burner alcohol stove stored beneath a desktop. The van roof is topped by two Boulder 90 solar panels paired with a Goal Zero Yeti Solar Generator that powers all his electronics. Rather than install a full sink and water pump, Zach opted for the low-tech solution of a five-gallon water jug. With no water hookup and limited space, there’s also no shower or toilet. The young filmmaker makes use of gym showers and public restrooms. “Filmmaking by nature is a nomadic pursuit. It’s a constant migration to and from different locations based on what the storytelling requires,” said Zach Both. 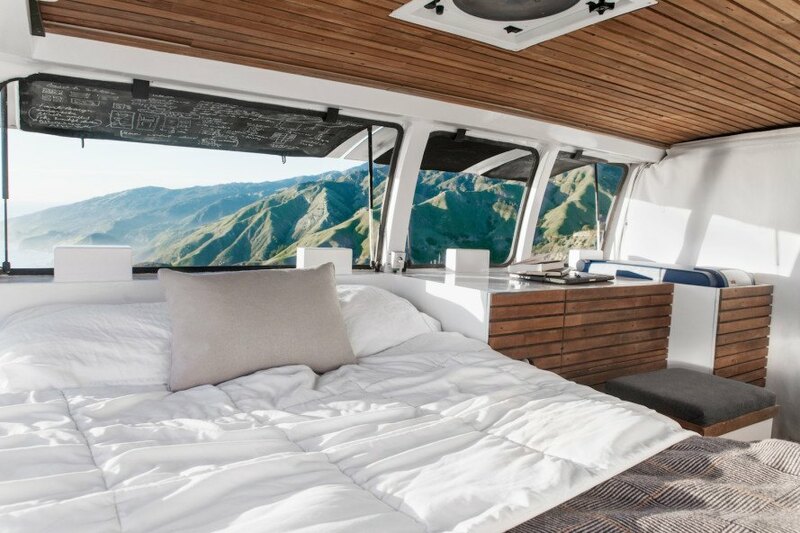 “With this van, I now have complete freedom to write a script surrounded by mountains, direct a shoot in a remote desert town and then collaborate with an editor or composer in Los Angeles—all within the same month. That would be impossible any other way.” For more information on how Zach was able to realize his mobile lifestyle, head over to The Vanual for his step-by-step conversion guide and digital nomad tips and tricks. Mobile (adjective) "able to move or be moved freely or easily" and Home (noun) "the place where one lives permanently"
Does it qualify as a home if the bed is not big enough to sleep in, you can not stand up in it, there is no water, toilet or shover? My car is a mobile home too then if I bring my cooler box and a grille! Converting side panels to pop out windows was smart. Air flow is critical in a mobile home, particularly one with low ceilings, because it can easily become a solar oven or sweat lodge...$19k is a lot to go without toilet, shower, or head room. 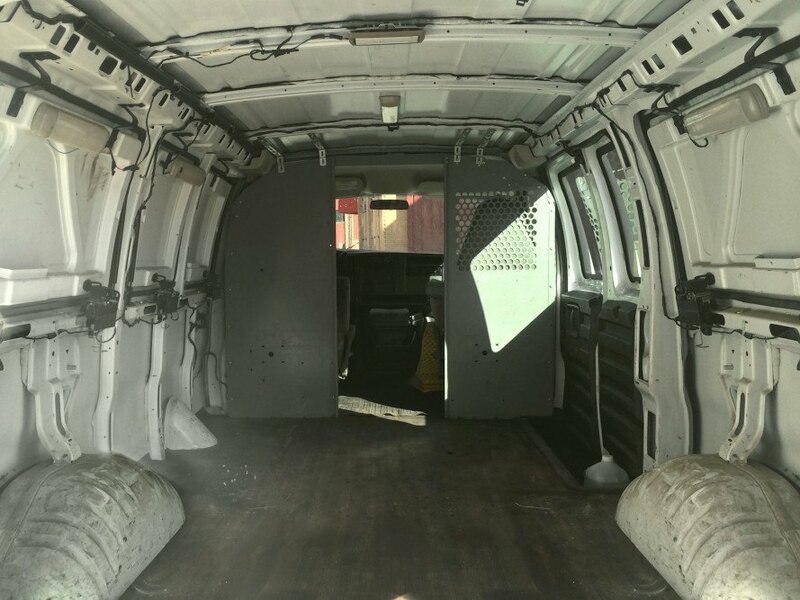 Before picture of the van. Zach bought his used 2003 Chevy Express van for $4,000 in August 2014 and spent a total of $15,000 to convert the van into his mobile dream home. While he concedes that the cost was high (and more than he initially anticipated), it allowed him to achieve a stunning custom build that maximizes every square inch of space and is tailored to his exact specifications. The exterior was kept white to stay as inconspicuous as possible, however, the interior sports a stylish timber-lined living space inspired by minimalist Scandinavian design principles. The converted comprises a futon bed on one end and a L-shaped desk space with an integrated kitchen on the other. His kitchen features an ARB 50-quart Fridge/Freezer combo as well as an Origo two-burner alcohol stove stored beneath a desktop. The van roof is topped by two Boulder 90 solar panels paired with a Goal Zero Yeti Solar Generator that powers all his electronics. Rather than install a full sink and water pump, Zach opted for the low-tech solution of a five-gallon water jug. With no water hookup and limited space, there’s also no shower or toilet. The young filmmaker makes use of gym showers and public restrooms. For more information on how Zach was able to realize his mobile lifestyle, head over to The Vanual for his step-by-step conversion guide and digital nomad tips and tricks.